From The Improbable Story of Robert Smalls, you may recall that after Smalls piloted his way to freedom during the Civil War, he received $1500 as his share of the prize money for the captured boat, Planter. As related in Beaufort 1849, the town of Beaufort, South Carolina was one of the first taken by the Union forces, and the mansions of Beaufort were turned into Army headquarters, barracks and hospitals, preserving them from destruction later in Sherman’s fiery path. After the war, the U.S. government imposed taxes on all property in Beaufort, starting from the date of occupation. (They didn’t, ahem, offer to pay the owners of the houses rent for the use of their buildings during the same period.) This forced most antebellum residents of Beaufort to lose their homes because either they couldn’t pay the taxes or had yet to return to Beaufort and had no knowledge that the taxes were in arrears. Grand mansions were auctioned by the government off at a fraction of their original cost to build. 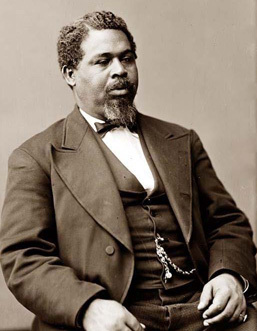 Robert Smalls, however, benefited. With the proceeds of his prize money he purchased his former master’s house on Prince Street in Beaufort. He also started a business, opening up a shop for freedmen (former slaves). He joined the Republican Party and was elected to the South Carolina House of Representatives, the South Carolina State Senate, and five times to the U.S. Congress. He participated in the writing of the new South Carolina state constitution and was largely considered the most powerful black man in the state for five decades. The Reconstruction era was one of the more ignoble in our country’s history. At first Southern white men were widely disenfranchised politically and economically. Then the tide turned and African-American men were disenfranchised even more virulently of many of their newly-won rights. (Women of both races would have to wait quite a while for their enfranchisement.) Though some positive things happened for freedmen, corruption was rampant. As the Reconstruction era wound down and Southern whites did their best to reduce African-American political power in order to regain their own (while the North turned a blind eye), Smalls was accused and convicted of bribery. He was subsequently pardoned as part of a deal that also dropped charges against Democrats who had been accused of election fraud. (I smell a set-up from the very beginning?) He spent the rest of his days in Beaufort as a shop owner and customs official. My favorite part of Smalls’ story is not his Civil War heroics nor his legislative record, but rather this anecdote. In 1875, long after the war, his former mistress--old, widowed, ill, and dreadfully impoverished--showed up at the house on Prince Street, perhaps believing it was still hers. Instead of turning her away, Smalls not only let her in, he ensconced her in her old bedroom and took care of her until her death in 1904, including personally serving her meals. Of all Smalls’ notable achievements it is this compassion and kindness that I find most astonishing. In Smalls' life we find war, politics, heroism, public service and scandal in a story that limns the tumult of our nation's struggle. We see a spectacular rise, an ignominious fall, and a humanity that shines across the centuries. Robert Smalls, Beaufort hero. Currently reading Beaufort 1849. Very enjoyable and a virtual tour of the era lived by my 4th Great-Grandfather, Des Rivieres Beaubien. The town's dance master. Ooh, a dance master! That would've been a fun character to include in the mix. Glad you're enjoying the novel.